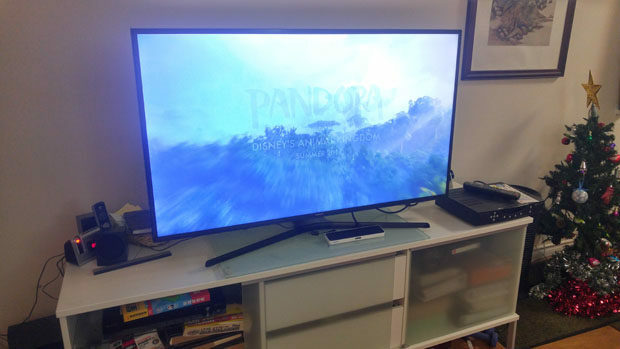 Before getting the new 4K TV, my family had a 40″ 720P Prima LCD TV that we bought more than 10 years ago. It cost $2000, and back in the day it was one of the most affordable large flat panel TVs. It still worked, but it lacked a digital tuner and HDMI ports, which means we can’t get the high-definition (HD) over-the-air (OTA) free TV signals without a converter, and most newer home theater gadgets can’t connect to the TV either. The TV was 720P, but my parents were still watching old standard-definition (SD) TV due to the lack of ports. Given how LCD TVs have become less and less expensive over the last decade, my parents decided to get new TV. 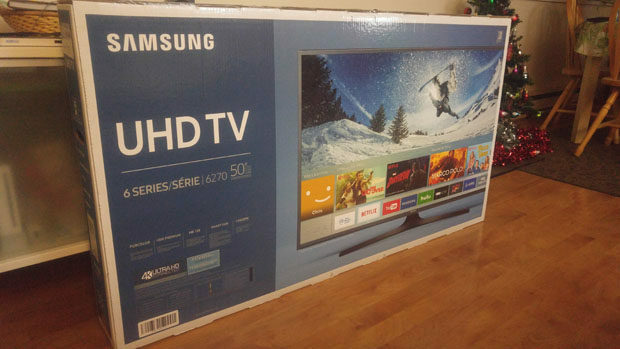 We browsed the Boxing Day ads, and decided to get the Samsung UN50KU6270 because it was from a good brand, and it was on sale for the price of $700 at several stores. There were other 50″-55″ 4K Smart TVs on sale for less, but the brands weren’t as good, and we figured those models will be snapped up by the early Boxing Day shoppers. Our new TV in a box. 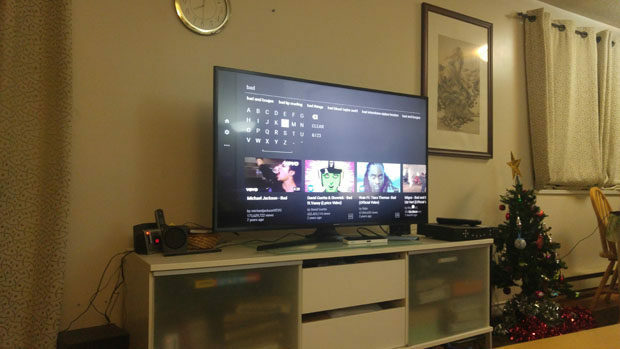 On Boxing Day afternoon, we went to the nearest electronics store and bought the TV. Upon unpacking the first thing we noticed is how light and thin the new TV is compared to our old TV. It’s about half as thick, and probably at least 1/3 lighter than the old TV. Also, despite having a 50″ screen vs our old TV’s 40″ screen, the height and width are about the same, due to the much thinner bezel of the new TV, and the presence of side speakers on our old one. In terms of hardware setup, the only thing to do is to screw in the stand to the bottom of the new TV and connect the power cord. We got everything set up on our TV cabinet and turned the TV on, and lo and behold the SCREEN WAS BROKEN! The unit we got was damaged during shipping and there is a big crack in the bottom right. Just our luck, to pick a broken unit out of the pile. We immediately packed up the broken TV, took it back to the store and exchanged it for another one. The only accessories are the remote and the power cord. We repeated the exercise of unpacking and setting up the TV, and made sure we got one that isn’t broken. 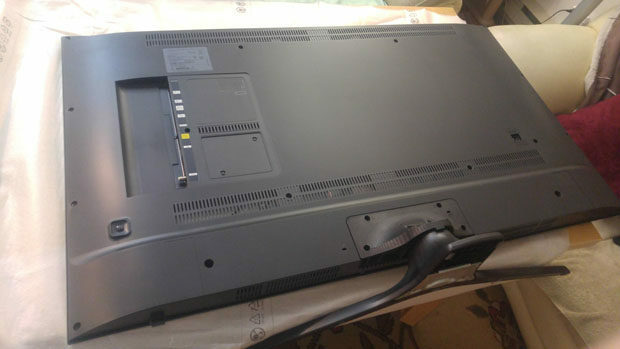 Once powered on, the KU6270 automatically goes through a series of setup screens to connect the TV signal and set up the internet connection. The TV has Wi-fi built-in and also has an Ethernet port for wired connection. We opted for the wireless internet. As for the TV setup, my parents have an IPTV box, which I connected to the KU6270 using a HDMI cable. 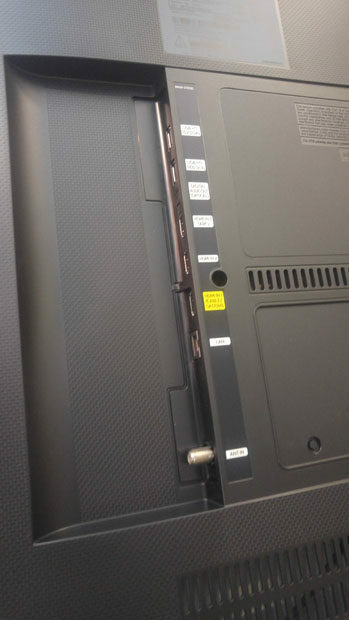 The KU6270 has three HDMI ports. The first one is for the cable box, and the third one has the Audio Return Channel (ARC) for home theatre systems. 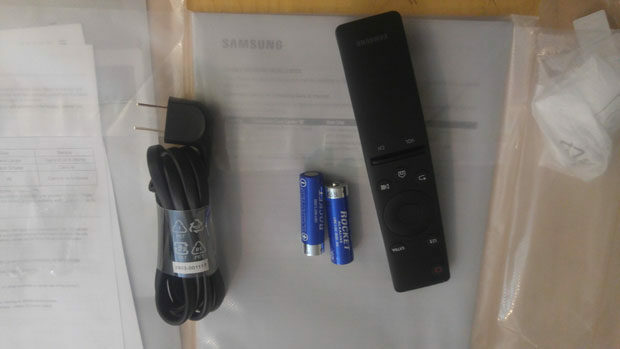 Along with the HDMI, the TV also has two USB ports (one designated for storage), the aforementioned Ethernet port, a coaxial connector for an OTA antenna, and a TOSLINK optical audio port. There are no legacy ports to be found here: no component, no VGA, no DVI and definitely no composite. I still have to figure out how to connect our old VCR and Wii console to this TV. Probably have to buy some converters. The ports of the UN50KU6270 are clearly labelled. After setting up internet and connecting the IPTV box, we gave our new TV a whirl. The picture definitely looks a lot better than old TV. We didn’t have any 4K content on hand, but 1080P videos on Youtube looks gorgeous. We can definitely see the difference in resolution, and the colors are a lot more vibrant. It’s so good that the images of real people look fake. Even the IPTV looks better because it’s now in HD. With the old TV, the box was connected using composite which can only carry SD signals. The interface is simple enough to use, and I’m sure my parents will figure it out with time. Like many Smart TVs on the market today, the KU6270 has Miracast capabilities, which means Android and Windows devices on the same wi-fi network and cast their screens onto the TV display wirelessly. I tried with a few Android tablets and phones, and screen mirroring works fine. I also tried with my new Windows 10 laptop, and I could use the TV as an extended display in addition to duplicating the main screen. The extended display function though did seem to have some bugs (sometimes the TV screen was slow to respond), but screen mirroring from Windows worked fine. Controlling the interface is the remote, which is small and very minimalist. There is no number pad on the remote. It’s mostly a couple of navigation buttons, and the power, volume and channel up/down keys. I think having a number pad would have been useful. Being a Smart TV, the KU6270 comes with a number of apps including a web browser. Using the apps with the remote is doable, but typing is a bit of pain since you have to use the remote the navigate the onscreen keyboard one character at a time. My parents want to use the TV to for internet browsing, so we ended up getting a Logitech K400 Plus wireless keyboard and trackpad to use for the TV. The K400 Plus works with the browser and the TV’s built-in menu, but app support is spotty. For example, keyboard doesn’t work on the Youtube app, but we can always use to the browser to go to Youtube instead. On a related note to internet browsing, we found out that the KU6270 did not support Chinese input. It has a bunch of other languages, but there is no Chinese which is a bit disappointing and surprising given the large portion of the population we make up. I guess my parents will have to live with using English only on the TV. 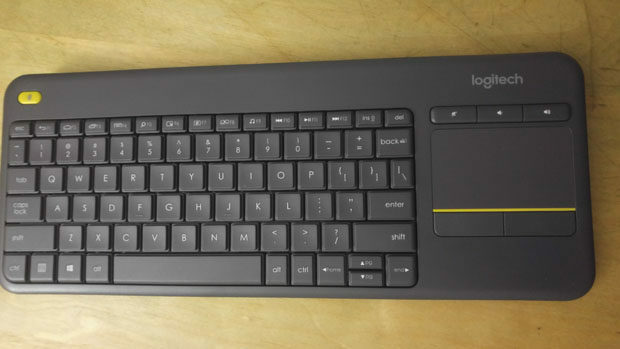 The Logitech K400 Plus wireless keyboard and trackpad. Along with the keyboard, we also bought an antenna to receive the local TV signals. The IPTV box my parents use can watch local TV, but it can be pretty unreliable so they wanted an antenna just in case. We bought a Philips SDV6226 amplified antenna from the closest local electronics store, and we picked this one because it was on sale and cheap. There are better flat antennas out there, but we want to see if this Philips will suffice. When I first set the antenna up, it only picked up 5 channels. 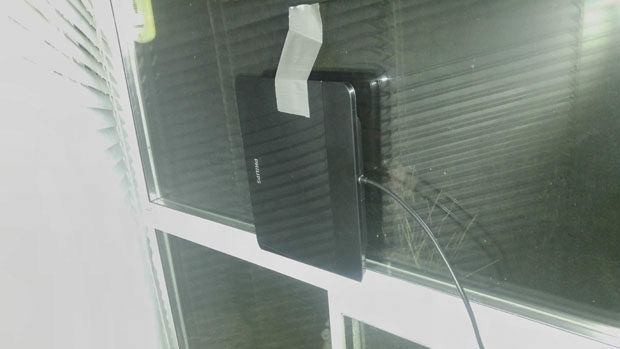 After some experimenting, I got 13 channels from putting the antenna on a window by using a bit of duct tape to put it in place. There are definitely more channels available in the Vancouver area, but the SDV6226 picked up the channels that my parents usually watch, so they are fine with it. We can get CBC and Global pretty well, MeTV is okay, and the signals for Omni and CTV are not so great. We also don’t get any of the American major networks from the Seattle area, which is probably due to the antenna and our low-lying location in Richmond. On the channels with good reception, the picture quality is better than that of the IPTV box. My antenna installation, with help from the ol’ trusty duct tape. That’s about all I have to write about my family’s new UN50KU6270 TV. It’s a pretty nice TV overall, and definitely a big upgrade over our old TV. There are some quirks to it though, and it’ll take a little time to get used to the capabilities of the new TV. Hopefully this TV will serve us well for years to come, and this TV will be ready when 4K content becomes widely available. As for our old Prima TV, my parents sold it for $30. Given how an off-brand 40″ 1080P TV costs about $200 on sale these days, a decade old 720P TV really isn’t worth very much. We are glad that somebody wanted it and hope it’ll be put to good use. Thanks for your detailed post. The photos of the back with the inputs were especially helpful. Some models of this TV seem to have composite/component inputs using adapters. But this one doesn’t even have the inputs, looks like it can’t accept composite at all? I was about to buy this TV, but that’s a deal breaker for me as I need to hook up my old Wii & Xbox. So I’m glad I found your post. Yeah. Not having composite is kind of a pain when you have the older gadgets. I think the ku6290 has component and composite, but pretty much everybody had the ku6270 on sale during boxing day.